We specialize in concrete flatwork and foundations such as driveways, patios, pools & pool decks, steps, sidewalks, commercial floors, parking lots, etc. From standard finishes to exceptionally creative designs. The founders of BuildPro have decades experience in high-end concrete projects. Our work is built to last and look beautiful for years. If you need a new driveway or patio for your home, office building, townhouse, or commercial property, then you have come to the right people. BuildPro Concrete Inc. is family owned and operated. We stand behind our work so that you will be proud to stand on it. Because we specialize, BuildPro Concrete Inc. is uniquely positioned to provide the highest quality, longest lasting, and most beautiful concrete driveways, patios and pool decks in the industry. And because we only do one type of work — exterior surfaces — we’ve become exceptionally efficient at what we do. That means we provide better value for your money than any of our competitors that try to do everything. Your driveway or patio is our best advertising, so we guarantee it to be beautiful for years to come at a price that’s right. We are concrete driveway and patio experts no matter if it’s a simple driveway for a modest home or an intricate design for a luxury estate. We do custom work so you get exactly what you want. Let us help bring your vision to life, creating the special look you want for your driveway, patio and your entire home. We add value, beauty, and function to every client’s property. If you can dream it up, we can make it a reality. No job is complete until you are 100% satisfied. We consider every job we take to be our client for life, not a one-time customer like so many fly-by-night contractors treat their work. We intend to earn your business today, and for years to come. We can only do this by being the best at what we do, exceeding your expectations, and providing exceptional results at a fair price. The job is only complete when you are 100% satisfied. We are always a phone call away if you ever have an issue. And we will be around ten years from now, this you can count on. 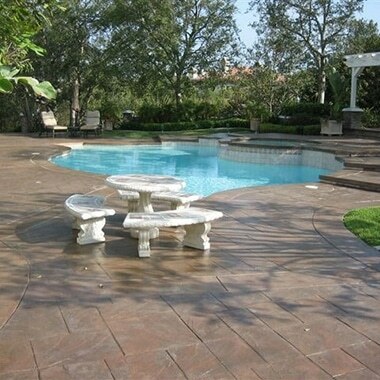 Not all driveways, patios, pools, or pool decks are created equal. And not all concrete contractors are either. Inferior work will cost you more in the long run than saving a few bucks by selecting a cheaper, but lower quality contractor’s low-ball bid. Read this report and learn some shocking ways disreputable and bargain-basement contractors cheat their customers. And learn what really goes into a quality concrete driveway, patio or pool deck so that yours looks as beautiful ten years from now as it does the day it’s installed. From a foundation of quality, trust, and value, we started our business nearly a decade ago helping St. Louis, Missouri, and Southern Illinois residents improve their homes. Let us show you how we can do the same for you. We are proud to have worked with some of the Midwest’s wonderful developments. Our Commercial Division is happy to work with developers, general contractors, and owners on any project big or small. Installing a new designer concrete driveway and/or patio is among the most cost-effective way to increase your home’s value. According to the National Association of Realtors, a new driveway can add $10,000-$50,000 more than the cost to the sale price of a home. For commercial properties it not only adds value, but increases business because an attractive and well maintained property attracts both new and returning customers. That’s a smart investment. Your property’s curb appeal is important, both for your pride of ownership and if you are thinking about selling. Your driveway is an important part of the overall look of your home’s exterior. It’s the main element connecting your property with the world. And it is the first aspect of your home that visitors, or potential buyers, interact with. Expanding your driveway to add parking, adding a beautiful patio in your backyard, or improving your pool deck. All of these not only improve how your property looks, but they all add to the ways your property can be enjoyed. A small investment adds a large amount of pride, fun, and function to your home. Concrete, as opposed to other paving choices such as asphalt, stone, pavers, and the like offers superior long-term durability and is as close to maintenance-free as you can get. Once every few years, a good power-wash and a re-application of sealer makes your concrete look brand new. That’s right, the benefits of concrete are substantial. Design possibilities — including color, texture, and shape — are limited only by your imagination. Concrete is eco-friendly, cost-effective, and the singularly most durable and longest lasting exterior surface material available, far outperforming asphalt. Concrete reflects heat, making it children and barefoot friendly. Concrete resists the harsh temperature changes in Missouri, and gives superior traction when snow or ice is present. A designer concrete driveway installed by the professionals at BuildPro Concrete will make your home more beautiful, useful and valuable. We are Saint Ann’s best concrete contractors, and we look forward to proving it for you. The founders of BuildPro Concrete are born and raised in St. Louis. Our family and friends live here. We went to school here. “What high school did you go to?” Our kids probably play little league with yours. We have nothing without our reputation, so quality and your satisfaction are our only priority. We stand behind our work 100%. No job is finished until you are totally satisfied. Our business does well year after year only by making each client so satisfied that they would hire us again, and recommend us to their family, friends and neighbors. We only accomplish this by completing your project perfectly to your satisfaction. We are proud members with an excellent rating with the Better Business Bureau, and are happy to supply references upon request. Copyright © 2019 BuildPro Concrete Inc.